I love the classic styles that Judy wears. So I wanted two timeless designs that also reflected her eye for detail. And like her daughter, the shoes had to be a big focus point! 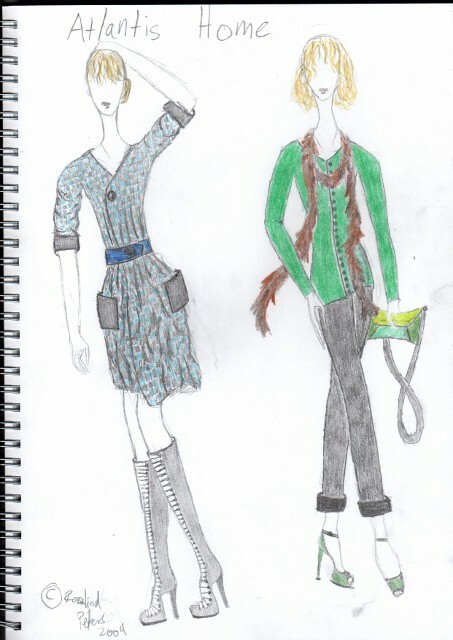 The checkered dress is cotton with the boots being leather. The grey trousers are silk and the green cardigan cashmere. I only discovered Style Bubble recently, but it has quickly become one of my daily reads. I love that she updates her blog so often, and she's a fellow British blogger! I was inspired by the quirkiness and whimsy of the way she puts her outfits together. The pleated t-shirt is silk and the layered pencil skirt is cotton poplin. 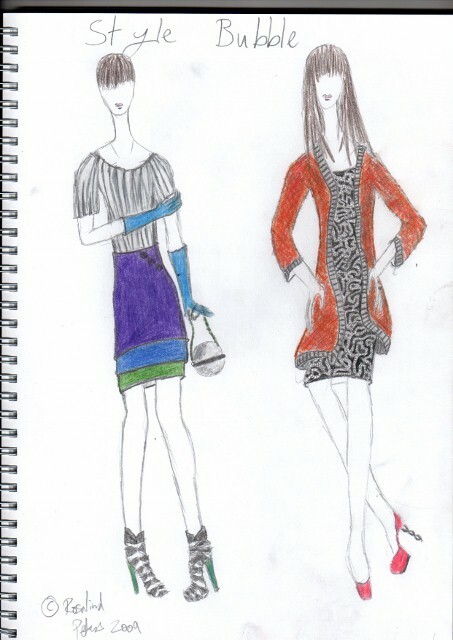 On the other design, the cardigan is a chunky knit wool piece with silk screen printed dress. Another recent find, 4th and Bleeker's blog is very interesting. Although not clothes I would wear, still ones to appreciate and admire. The shorts are silk and the t-shirt is jersey with lace collar and pocket. The cardigan is finelycrocheted with a green felt bowler hat. The pink dress is flannel with a drawstring waist and the tights are lace. Natalie wears a lot of tailoring and classic shapes, which I hope is reflected here! 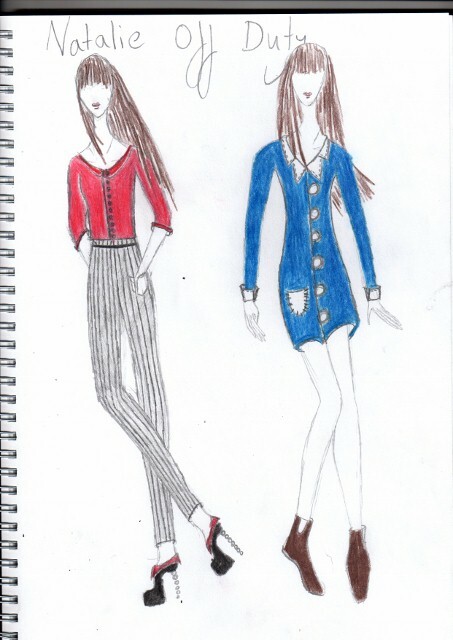 The red cardigan is cashmere with the pinstripe skinny trousers being cotton. The shoes with cuff detail are leather. The blue shirtdress is silk (yes! I love this fabric) with stitching detail and the Chelsea boots are leather. Oh the joys of the Christmas holidays. Spare time galore, creative projects to do, blogging more frequently. As due my promise, I'm going to try to post more frequently over the next two weeks to make up for the very sporadic postings over the last few weeks. I really enjoyed working out and drawing these designs. I think getting inspiration from other bloggers is very interesting, but I'm being inspired by so much at the moment! - Any old (i.e. classic) film including Audrey Hepburn. I want her entire wardrobe, especially those immaculate Givenchy pieces.. Speaking of which, that Audrey Hepburn auction sounded like my dream event, just to get to see them! But being at school and living a few hundred miles away from London does have it's drawbacks. - Vintage issues of Vogue. I am currently collecting these, and the breathtaking images are worth every penny. - Old books. I would also happily live as Alice in Wonderland.. I'm always getting inspiration for designs from fairy tales. - Nature. It's surprising how much inspiration one can get from a tree or the colours of autumn! - Old photos. Now what happened to that coat that my grandma was wearing in that snapshot I have of her? - Tim Walker's photography. One of my favourite modern photographers, his fantastical shoots are so inspiring. I'd love to be able to do photography like that for a living! His recycled shoot for British Vogue including a bolero made from washing up gloves was brilliant. - Vintage clothes. Definitely the biggest influence over my designs. - Anything that could have been worn by an elderly relative! - Silk. Probably my favourte fabric ever. My wardrobe is being take over by silk shirts, slips, knickerbockers etc.. Yes, I could blather on…and on... about my inspiration, but I'll stop here before I get carried away. So what are your inspirations at the moment? I'd love to hear yours. 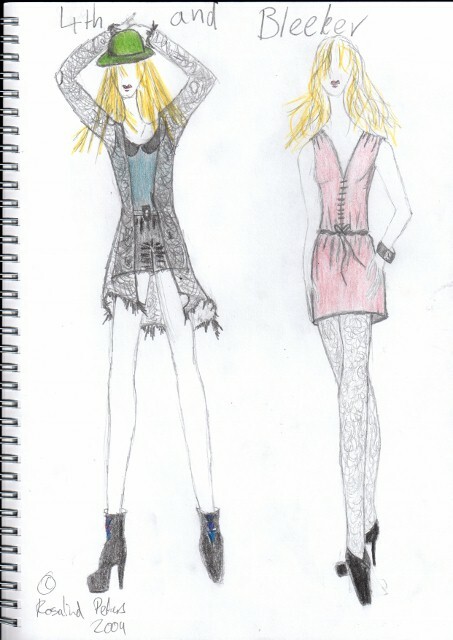 PS- Does anyone know how I could contact 4th and Bleeker to tell her I did some designs based on her style? I couldn't find an email or anything.. I love those sketches. I wish I could draw. I am horrible! I tried once to do my own sketches, but sadly I failed miserably. Finally, I decided to stick to imagination and thoughts and mental images of what I would do with clothing. Its abit of a amature blog,but a'well. What lovely sketches! I sketch, too, for fun sometimes! These are really fun! I love the Style Bubble ones in particular. these are so cute, I agree with all your choices for inspiration - they all have amazing style! Love the cute little drawings! Found your blog from Natalie! Love your blog! omg you are so cute to do this!! (dont wanna toot my own horn although it may seem that way) I do do some myself check them out on my blog if you like! Such cool sketches! I lov the way you got the personality of each blogger you pictured! These sketches are fabulous. Great work! I love this series & your sketches, Roz. I don't even know the post 4th & Bleecker but now am curious! (I've got various friends who live right near that corner.. including my brother's apt. in town). I've got the most wonderful letters from people I met at the Audrey Hepburn thing, which I can't figure out how to put into a post as they're long. (not like that stops me!) but one is really long. Actually I'm going to forward it. I've still got so many shots I haven't posted. Yet. Try using a more confident line in your illustrations. I had this problem a while ago, where I did lots of sketchy lines to make up my shapes, and my tutor said something along the lines of: "Lots of hesitant lines say 'I don't know what I'm doing', but one confident, clean line says 'This mark was deliberate; I meant it'". It's some of the best advice I've ever gotten. If you end up doing design, it seems like your colour palettes will be excellent.